One of the coolest pedals I have had the pleasure of trying out recently is the analog DryBell Vibe Machine V-2, an awesome quality Uni-Vibe® pedal handmade in Croatia. It features a variety of unique functions so let’s dive right in! As pedal boards become more and more complex with more and more pedals, real estate is a huge factor for many when buying a new pedal. 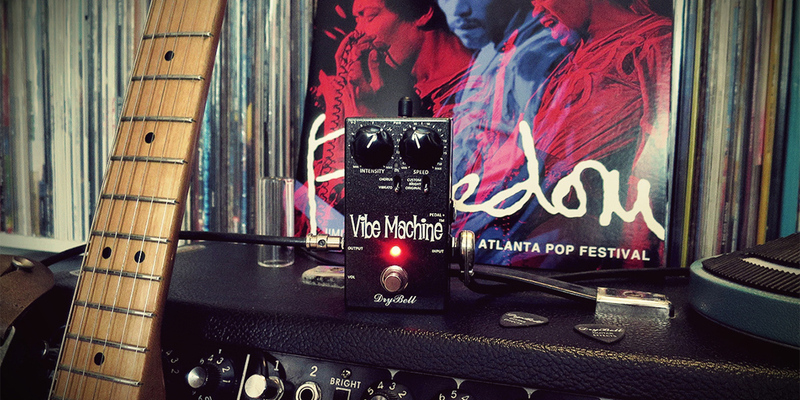 The Vibe Machine packs a huge punch for its relatively small size, making it a no-brainer for anyone trying to get that illustrious “vibe” tone. The Vibe Machine V-2 also contains highly customizable trimpots and tap tempo to allow for its placement anywhere in your pedal chain. You can also easily control the pedal with an expression pedal or new DryBell F-1L Footswitch. One of my favorite aspects of the F-1L Footswitch is being able to adjust the speed of the Leslie® delay so you can really dial in whatever specific sound you are aiming for. With three new side controls, CHORUS, GRIT and CUSTOM, you can adjust the depth of the vibe modulation, the presence of the V-2 and the input impedance. Go ahead and replace your other chorus / vibrato pedals – there’s no need for them anymore with the Vibe Machine, because in addition to tapping into those effects, you are getting so much more. I was impressed with the ability to create such an amazing vintage tone through my Strat and my Gretsch for bluesy type solos. At higher intensity on the vibrato setting, the pedal doesn’t lose its authentic tone, unlike some of its other contemporaries. With the chorus setting on a lower intensity, the resulting sound is very clean and very shimmery, even when used with a heavy fuzz or overdrive pedal. I usually like to test out a new pedal while running some alternate picking progressions on barre chords. Even while running through minor chords like Emin on the 7th fret, the Vibe Machine stayed resonant and clear, one of the most important aspects for me when trying out vibe pedals. It’s just that easy and it just sounds that good. This pedal is a rockin’ little machine that is just waiting to be dialed in. Pick up your own, grab your Strat, and roll into some “Little Wing” with confidence and style. Street price is $298.75 and you can order them direct from DryBell.com. Don’t forget the footswitch! Monique Hernandez-Fuentes is an independent musician based out of San Francisco, who spends her time obsessing over gear and writing for GuitarTricks.com. What’s the deal with the BBE Sonic Stomp?